A few years ago I discovered that the six-year-olds in my class couldn’t differentiate between a nickel, dime or quarter, much less a half-dollar. They did recognize a one-, five- and ten-dollar bill, along with a penny. With parents using debit and credit cards for most purchases, children have few experiences with cash. With further investigation, I found out that these students didn’t get an allowance. Mom or Dad added whatever the child’s requests, within reason, into the shopping cart. Having a piggy bank and counting the money over and over to determine if there was enough for a purchase from the ice cream truck are parts of my earliest childhood memories. At three I knew the difference between a nickel, dime and quarter, and the combination of coins needs for a frozen treat on a hot day. Children need an allowance beginning around age three that is not tied to chores, but given on a weekly basis. A dollar is probably right for a three to six-year-old, paid in differing cash combinations each week. 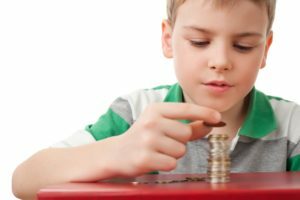 A four- and five-year-old (and teenagers too) can begin to understand the family budget by using a dollar’s worth of pennies. Figure your monthly budget by percentages. Make labels on 3” x 5” cards with a word and pictures when possible for house, car, gas, food, insurance, utilities, clothes, entertainment, taxes and whatever expense categories you might have. Place the label for taxes on the table, and place the percentage in pennies under amount label. I am using 25% for the tax rate in this example. ”For our home we use 12 cents of our dollar.” Place label, and put 12 cents underneath. ”For food we use another 12 cents.” Place label and coins. ”For our car and transportation, we use 6 cents.” Place label and coins. ”For our electricity and other utilities, we use 6 cents.” Place label and coins. ”We spend 4 cents on clothes and shoes.” Place label and coins. At this point bring out three jars, or banks, with the labels: ”dreams,” ”service” and ”wishes” on them. Put the corresponding amount of money in each jar. Take the time to help your children learn about where money goes and how to save it for dreams, wishes and service to others. That will be a big help to them for all their lives.